Into the Storm is the bland storm-chasing/generic family drama you never wanted. Despite a potentially entertaining premise and a competent director, it’s the movie equivalent of Amos Hart (played brilliantly by John C. Reilly) in the musical Chicago; within moments after seeing it, you’ll forget it was ever there. Possibly the only aspect of the movie you will remember is the nearly schizophrenic way director Steven Quale employs a found footage style of filmmaking. From the first scene, Quale sets the movie up as though the entirety of the action will be captured via cell phone or handheld camera recordings, going so far as inventing the most asinine excuses for cameras to be present. But, that approach is used only intermittently. Half of the movie is filmed with traditional cinematography and a solid fourth wall between the characters and the audience. This divergence is never reconciled or explained. Regardless of the director’s poor choices behind the camera, nothing could have made John Swetnam’s script remotely engaging. Filled with hackneyed dialogue that belongs in a SyFy Channel original movie and characters more shallow than a gathering of Kim Kardashian loyalists, Into the Storm is a lifeless bore that fails to build suspense or excitement at any point in its 89 minute run time. Swetnam writes his characters like his exposition: without a hint of subtlety. Each line of dialogue lands with a resounding thud as it does nothing to develop the characters but works only to explain to the viewer their relationships or their weakly drawn motivations. Case in point: The family at the center of Into the Storm consists of Gary (Richard Armitage), the dad who is strict and dismissive for no reason; the sensitive and lovesick older son Donnie (Max Deacon); and the goofy younger son who provides comic relief, Trey (Nathan Kress). None of the three has a single unique characteristic or emotion and all three speak as if their dialogue was borrowed from a 90s after school special. (At one point, Donnie actually says, “You wouldn’t understand, Dad.”) Making the plot more contrived, Gary is the Vice Principal of the high school that Donnie and Trey attend, which only exacerbates the artificial feeling of the movie’s relationships. When an epic tornado system hits Silverton, the small town where they live, the family is separated: Gary and Trey taking cover in the high school while Donnie is attempting to impress a girl at a nearby abandoned factory. In the most “Oh, come on!” moment of the film, Gary is able to find a way to reach his son by coincidentally crossing paths with the other lifeless characters running through the movie: Pete (Matt Walsh) and Allison (Sarah Wayne Callies). As the tornado has been gaining speed and strength, storm chaser/documentary filmmaker Pete and meteorologist Allison are doing their best to track the massive storm in hopes of getting some footage Pete can sell to a cable TV network. When they run into Gary and Trey, Allison is willing to help them reach Donnie, but her goodwill is overshadowed by the horrific events that follow their unexpected altruistic detour. Meanwhile, Donnie and his unrequited love, Kaitlyn (Alycia Debnam Carey), have become trapped at that abandoned factory and may possibly drown if Gary doesn’t reach them. In the spaces between Swetnam’s soap opera dialogue, director Quale does manage to slap together a few impressive shots of the storm’s destruction and unfathomable size. Sadly, all of these images were included in the trailer, so if you watched the marketing footage, you’ve seen the best parts of the movie already. 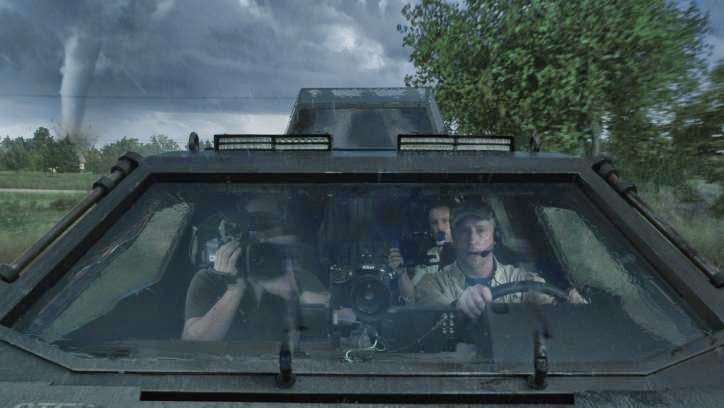 The only other entertaining piece of the movie is Pete’s storm chasing tank – which resembles Batman’s tumbler from the Dark Knight trilogy – and its testosterone shot into the film’s limp arm. Into the Storm is uninspired and forgettable. How it avoided going straight to VOD is a mystery for the ages.